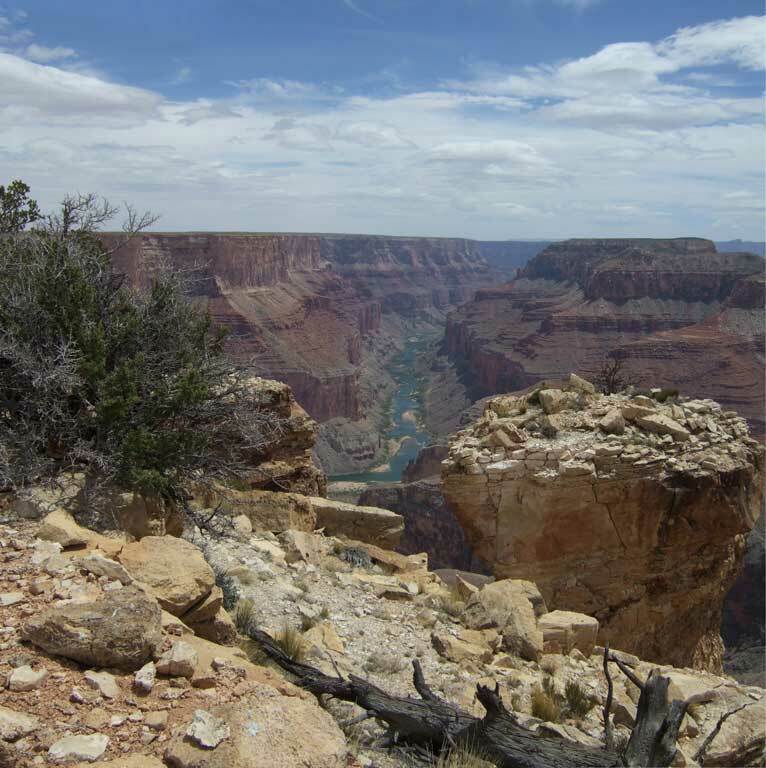 Simply the best viewpoint anywhere at Grand Canyon and no tourist crowds or parking problems to get here. This waterless plateau is some distance beyond the end of rugged Trail 31 and should remain a place of perpetual isolation and timeless solitude. The very end of Boundary Ridge looking down the Marble Canyon corridor past Nankoweap delta. A little grainy and maybe not up to the best photo image quality but still an important one, taken after sunset in a long exposure resting the camera on my knee at the edge of the Esplanade looking down on Fossil Canyon delta. We are at camp the 8th day out on a loop from Royal Arch along the river, up Fossil, and now making our escape with what water we have been able to collect from the head of Fossil Bay -- not very much of it and just too much mineral content to be good for us. Below Eminence Break on the last day of the high-flow experiment. On Sunday morning the flow is decreasing. At the sun line on the river a research boat is working a laser sounding system, motoring a line across the river to measure the surface level and river depth -- the flood having shifted things around underwater. Not very visible unless you know what to look for -- at the bottom center of the photo is a laser reflector tripod on a rock for a reference point -- there are 2 others covering the eddy being surveyed. The big boat is at the research camp on the beach upriver, and the route is in the Redwall cliff above. This ramp is the Eminence Break fault with an offset about 200 feet. 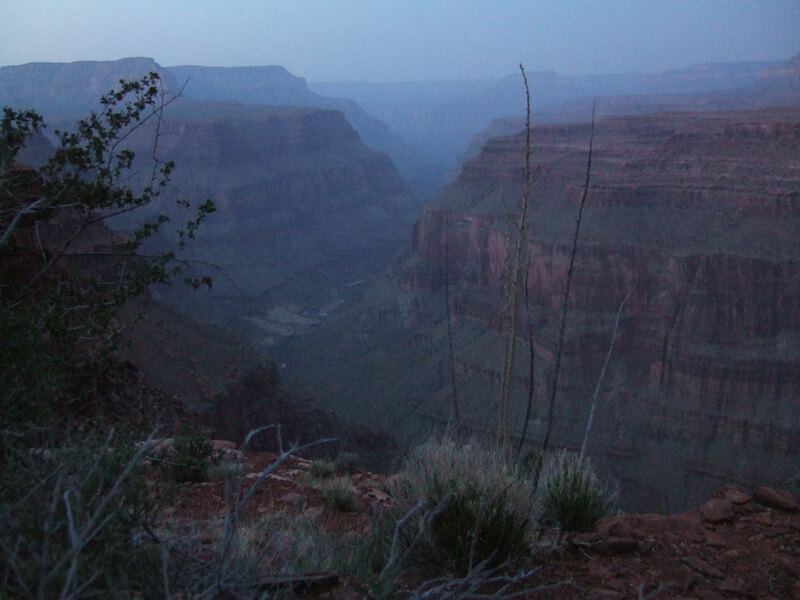 The lowest place on the skyline is where the fault continues to the rim. It's extremely steep and we all have to be careful not to bump a rock loose and tumble down onto someone. The research group had been stationed here the whole week doing about the same thing every day, and welcomed visitors -- glad to share campfire conversation, food, and beer. This photo is from a weekend visit to Eminence Break, about a half-day down and a half-day back up with a few minor cliffs to negotiate and all very steep. The fault is dramatic here because everything else on top is so flat. 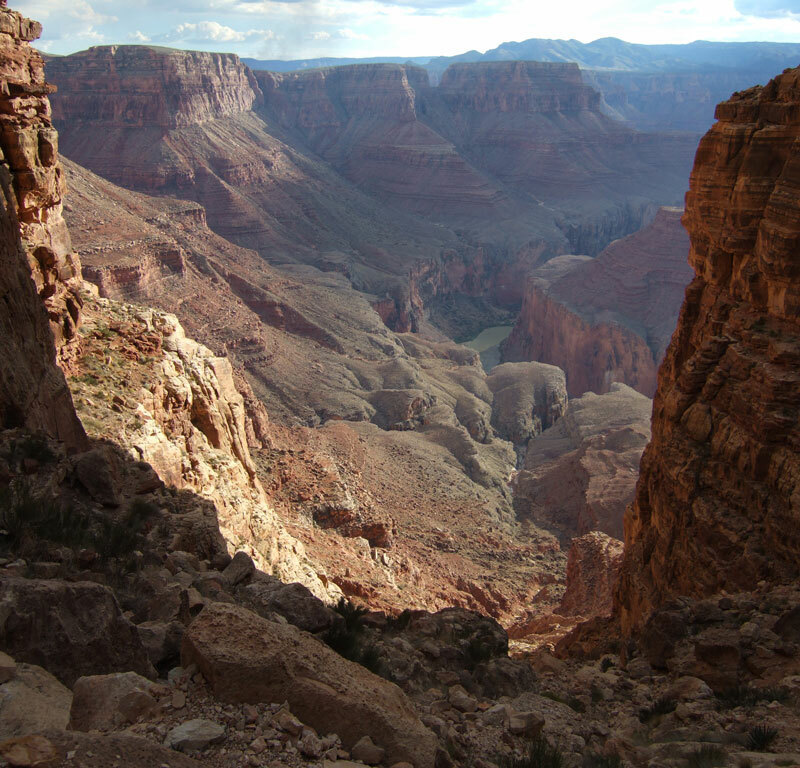 The fault makes the "break" in the cliff -- this photo is at the top couple-hundred feet in the Kaibab, looking approximately southwest from the neck of Eminence Break/Tatahatso plateau. 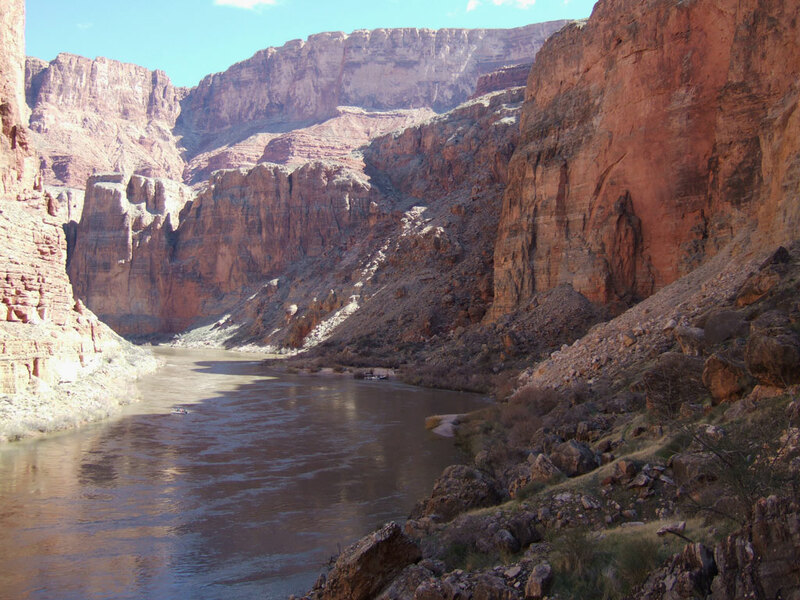 The river is a little muddy -- it's just about 3,000 feet down from the rim. Just left of the river gorge the fault continues and the top of the Redwall steps down to the west. Landscape features visible include Point Hansboro on the inside of the bend, Sase Nasket the near horizon, Boundary Ridge and Saddle Mountain center-right far horizon. Some smoke shows from a cluster of fires on Walhalla Plateau in the distance.